CADFARCH, reputed to have been a member of a family of unspecified saints, St. Cadfarch was a sixth century disciple of St. Illtyd (6th November). He is believed to have founded a church in Pengoes, Powys, Wales, where there is a holy well known as St. Cadfarch’s Well, said to have healing properties. among the Righteous of the Age of Saints. EVERGISLUS (EBREGESILUS), an early fifth century-Bishop of Cologne. St. Evergislus was martyred by bandits whilst visiting Tongeren in present-day Belgium. 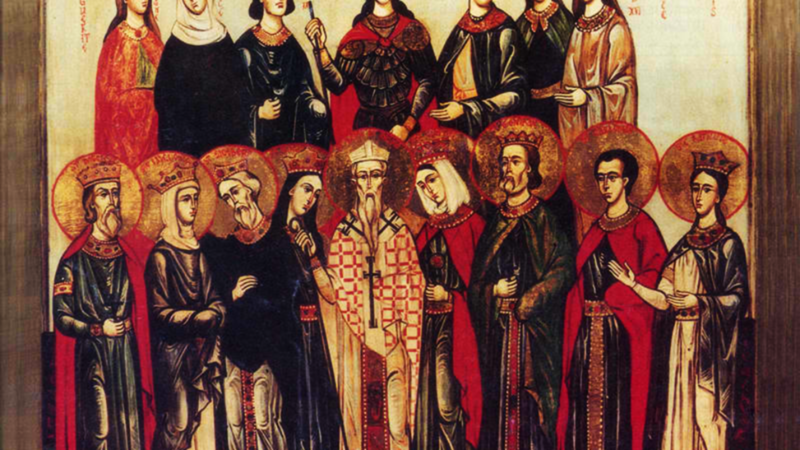 FELIX (AFRICANUS), AUDACTUS (ADAUCTUS), JANUARIUS, FORTUNATUS, and SEPTIMUS, early victims of the Diocletianic Persecution in 303. St. Felix, Bishop of Thibiuca in Africa Proconsularis, despite every enticement, refused to surrender Sacred Scriptures to the authorities. As a result, he along with Audactus, Januarius, Fortunatus, and Septimus, were martyred. FROMUNDUS (FRÉMOND), Bishop of Coutances in France from circa 674 until his repose circa 690. Whilst bishop, St. Fromundus founded the women's Abbey of the Holy Virgin in Ham, Normandy in August 679. MAGLORIUS (MAELOR), a native of south Wales and possible relation of St. Samson of Dol (28th July), whom he accompanied to Brittany. In Brittany they both became abbots, St. Samson in Dol, St. Maglorius in Lanmeur. Following the repose of St. Samson, St. Maglorius was appointed to succeed him as Bishop of Dol. Later he retired from his See, and went to Sark in the Channel Islands, there he founded a monastery where he lived until his repose circa 575. Later the relics of St. Maglorius were enshrined at the Église Saint-Jacques-du-Haut-Pas in Paris' 5th Arrondissement. MARCIUS (MARK, MARTIN), a hermit at Monte Cassino, whose virtues were acclaimed by St. Gregory the Dialogist (3rd September), and was said to have been a wonderworker by Peter the Deacon, librarian of the Abbey of Montecassino and continuator of the Chronicon Monasterii Casinensis (Montecassino Chronicle) . Towards the end of his life St. Marcius left Monte Cassino and spent the rest of his life as a hermit in a cave on Mount Mondragone, where he reposed circa 679. MARTIN of VERTOU, ordained to the Deaconate, or possibly Priesthood, by St. Felix of Nantes (7th July), St. Martin was noted for being a wonderworker, as well as, being devoid of any skill as a preacher. He founded a hermitage at Vertou 8 km / 5 mi south-east of Nantes, in time the number of disciples who gathered around St. Martin necessitated founding an abbey, of which he served as the first Abbot. He reposed in 601.